Amidst the ever-changing features of real estate sales, it is comforting to know that some qualities never go out of style – like going the extra mile and operating with integrity. These qualities and more have been a part of the business philosophy of Jane Yoder for over 30 years. She was taught the Golden Rule by her parents who also modeled it. For Yoder, there really is no other way to operate. That is why she is known as the REALTOR who goes beyond the sale. Jane finished high school unsure of her future. She had developed quite a skill in typing, so she found a job that matched her skill set. Yoder needed time to consider the idea of attending college and thought it wise to embrace or eliminate that option. After one semester, she determined it was not her cup of tea. Thus, Jane decided to get married! It turned out to be a stellar decision, as she and her husband, Lavon, will soon celebrate 50 years together. Yoder’s first exposure to real estate came as the couple purchased a home in the country on two acres. Jane moved a 10-foot-by-50-foot trailer on the property, and they began a four-year renovation. They enjoyed their $5,000 investment’s four-bedroom and two-and-a-half bath home for a long time. When the house was complete, the Yoders sold the mobile home for nearly the purchase price, enabling them to live rent free for those several years. In the mid-1970s, Jane made the decision to stay at home and begin a family. For a time, she also sold Mary Kay products, eventually becoming a sales director. The early ‘80s brought their son, and she once again stayed home for a time. The family longed to work in rehabbing another home, and they purchased one that had been burned. Lavon added to the effort by securing a builder’s license. The combo built two spec houses and were hooked. In total, the Yoders built 14 homes. Lavon worked for nearly four decades for Trinity Lighting, so his involvement came after hours and weekends. Jane played the role of CEO in administering the details and developed quite a few skills in design. During the process of those building experiences, Jane decided that she could take care of the real estate process by obtaining her license. The rest is real estate history. Jane’s background provided extensive knowledge and experience for her real estate career. She loves the work of helping people to find homes that meet their desires and that work for them financially. Paying the appropriate price is important for the clients who wish to re-sell the properties later. 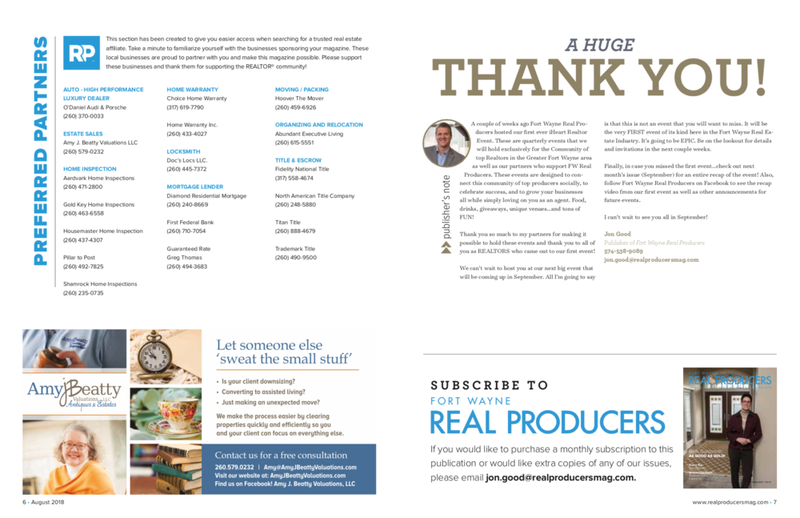 Jane notes that REALTORS must respond quickly, and she loves the fast pace. She notes that obstacles are just part of the business. Learning to sell short sales was hard for her since it involved the anxiety of her clients, but her determination to persevere in learning made her adjustments easier. Yoder’s knowledge has grown, and it is the asset that most cannot enjoy today. “It takes a long time to accumulate the right kind of knowledge to really help clients, and many today entering the field will have to invest the time to get it,” she observes. Jane is quite adept at judging the values of homes and the values of improvements. She can advise which renovations will have the best return, and she is well acquainted with the things that families want to pay for. Her days in new construction help her to advise those who desire to build, and she is always seeking to maximize a family’s design plan by adding low or no-cost options that enhance the living features of a home. Jane and Lavon have three children and five grandchildren, so most of their free time is spent with family. In addition, they enjoy traveling and ride motorcycles – Jane rides on the back. They are heavily involved in their church in worship and missions. Lavon spends one month in Africa each summer working on improvements for hospitals and churches. Music has been a part of Jane all her life. You can find her at the piano for the 8 a.m. service, and she also loves to sing. The couple supports several different charities, which demonstrates their desire to “be there” for people. For those who desire to be an agent today, Yoder stresses the idea of finding the best mentor possible. The industry education does not teach everything one needs to know, so Jane suggests they find someone who wants to impart practical knowledge. For those who have been selling awhile, Jane encourages them to remember to care for the client and to be flexible. Yoder considers herself to be privileged in her career of selling. Because they were blessed with good careers and sound financial practices, Jane observes that she did not have to worry about putting food on the table and could develop the habit of keeping the right focus in sales. “I always ask myself, How can I help my client, and if I were the client, what would I desire.” Income and referrals follow this behavior. Whether it is an upscale home or one that is priced lower, Jane helps with the same vigor and focus. She also appreciates her company that has always stood for integrity and which has always encouraged agents to be service-minded. Jane Yoder values service, integrity, knowledge and the Golden Rule. Her connections in the industry have been an amazing help to families who need other resources to enhance their homes. 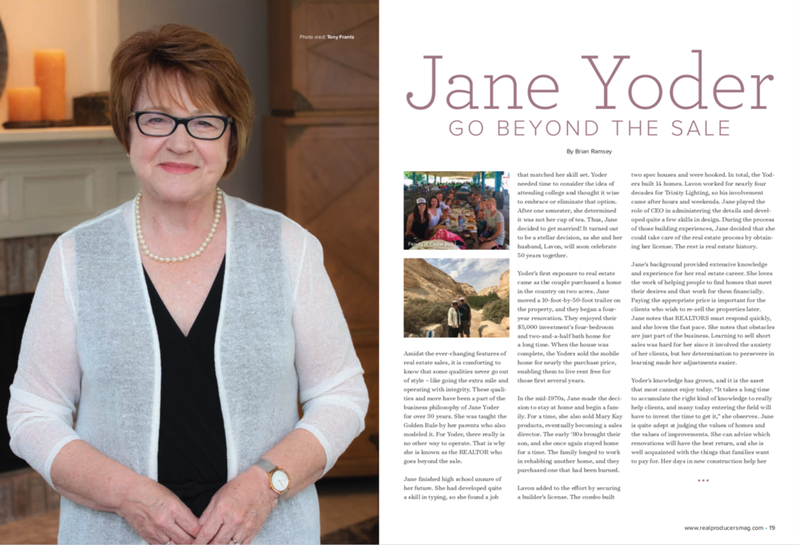 It is all a part of Jane’s commitment to “go beyond the sale,” and that commitment has garnished a wonderful career! Rookie of the Year my first year in real estate. I have owned a dance studio in Fort Wayne since 2006. I just sold it two weeks ago because I could no longer maintain running two businesses as effectively as I would like, and also find time to teach classes. I also managed Chase Bank for many years, did mortgages and excelled in customer service, which is where I found my love of real estate. I love working so many different sides of Fort Wayne and just Indiana in general, that I see the many different trends and educate myself to the point I am knowledgeable enough about so many areas when working with different clients. The most rewarding part of real estate for me is when I am able to find the perfect house that feels like home for that client and build that relationship to where they trust me and believe in me and my expertise – then I know I’ve done a good job. My biggest challenge right now in real estate is finding homes for sale in such a booming market before it sells or finding my clients in multiple-offer situation even when they ask for nothing and offer everything. What a major advantage for such a booming market in Fort Wayne, IN. Real estate is a business where you can make it what you want. You work hard, you put in the time, your income can be limitless, and YOU control that. Making people’s dreams come true and being able to be a part of their dreams and success. Being rewarded for something you absolutely love!! I am engaged to a wonderful man, Tim, who helps me and supports me on this journey called life. I have a 16-year-old son, Peyton, who plays baseball religiously and is very involved in the church. I have a 14-year-old, McKenna, who has taken on my love for dance. She recently made the Carroll dance team and competes both regionally and nationally. She too is very involved in church. Both kids make wonderful grades and make me proud to be their mom. I will soon be a stepmom to four amazing kids: Brooklyn, who is 20 and graduating nursing school. Brayden, who is 19 and just finished real estate classes in Georgi. Rylei, who is 13 and plays soccer and cheers for her middle school. Auburn is 6 and brightens everyone’s day and has a newfound love for dance. I love to work out, dance, watch my son play travel baseball, watch my daughter in all her dance, and Tim and I started a landscape business, Elite Landscaping and Design, which he has done in Georgia for over a decade. Work hard, gain all the knowledge you can, and ask questions. In closing, is there anything else you would like to communicate using this Ft. Wayne Real Producer platform? Do what you love, be honest, build relationships with your clients, and the rewards are endless.